Gratitude for the teachings and protection. I have followed the path of self-knowledge and modified many things in my being (I know that I still have a lot ahead of me), but it seems that I can not access my heart, so that I never know where to go, I can not identify my gifts, no I know very well how to release situations that repeat themselves. Am I some lightworker? What did I come to learn? How to recover my compass? Greetings daughter. Be in the light, in your own light, today and always. What is happening is not that you do not know where to go, that you can not hear the heart, but that you simply do not trust your own process, your intuition. When you are in a situation, where a soft voice tells you, follow this path, you simply do not believe because you seek the logic of situations according to what the world has taught you according to your senses. It's as if they told you, go here and then a logical hook tells you, there is no logic in that choice, and you change the path. Times later you wonder why I did not follow my intuition? Why did not I trust the process? Go on training, child, your intuition. When entering a crowded parking lot and without vacancies, ask yourself: I am, what is the best way? Trust your intuition, because your presence has the panoramic view of the situation. She knows where the vacancy is, just trust her. What happens, daughter, is that many of you simply do not trust the process, do not trust what you are shown by whether you find yourself or understand yourself. You look at yourself from the lower Self, from the mental view. And it is logical that the mind will not be able to tell you where the available space is, because it simply does not understand that language. But the I AM presence connects to everything that is and will be able to lead you quickly to a vacancy. You look at each other in a logical way, as small and thus do not allow you to connect to everything you represent, because that connection is not through the mind but only through intuition. Intuition will always tell you the way, but it does not respect logical rules. It possesses the highest wisdom of its entire cosmic constellation. It is enough, then, that you trust the process, that you give voice to intuition, and not allow the hook of the mind, of logic, of what is palpable, again to lead you to the Lower Self which does not comprehend the world as it is. Be in that certainty, give voice to your mind. Dear Masters. I and my love, we go through the 21 day process to live light, and we really feel their presence in our lives. I feel that we are growing, but oscillating between moments of great connection, and times of conflict and unconsciousness in our relationship. I would like to know: how can we sustain this unconditional love that hits us with flashes? How to avoid new knots without running away from our cleanings? Without denying our shadows? Our relationship has helped us to overcome many barriers and recently I even moved to a city, but I still felt a lot of oscillation in prosperity during these months, showing sexual blockades. Is there a direct relationship between the harmony of the relationship, and the creation of the prosperous life we ​​want to create? The contact we had with guides brought a lot of criticism to her, more than me, but I know that I am also responsible for our moments of fights. How can I fulfill my part? Is there any specific programming or practice that could help me at this point in my journey? I feel very grateful right now. Gratitude masters! Thanks friends! Beloved son. I'm a Master Lis. And in the first place I bring my feeling of gratitude, for being part of a work that we have brought a lot of light, in the irradiation of the White Flame, which is the Living of Light. The Living of Light, beloved son, is just one of the paths that can choose to work the interior cleaning, to then allow the free flowing and unlocking of its pure inner light. As a divine seed, you know that you are only light. And all you observe, moreover, are only material manifestations so that you can be here in this experience of incarnation. Realize dear child, that work was very important for you to learn to look at that light that is you. And who learns to radiate with this work that he set out to accomplish. But child, this work does not remove the pains and traumas, it brings them as unconscious memories of past experiences. Today you are aware that you are a being of light, but when the information arrives from your akashic record, to assert to you that it is different from that, you for a moment believe the impulse is coming through that record. The work that needs to be done is to illuminate these records. To enlighten the child, you must observe yourself and identify all the moments where unwanted behaviors and feelings begin. Stop for a moment and focus only your attention on that fact. Remember that it is light, and then begin to realize how this fact or thought is not part of that light, is disconnected from you, you begin to see it as something external. All this work is done in meditation. Then, by being able to separate the fact from your light, perceiving it as separate things, you can then work accessing that record, which is the fact and behavior disconnected from you, and use your own light of the present time, which you can now see part of you, by the wisdom gained, and use that light to illuminate this record. You are able to access past rows, and illuminate them with your light today. And it is also able to access your manifestation of the future, to receive the still more glowing light, to aid you in today. But by allowing the record of the past to act in your present, it is your choice, and you can work it out to illuminate it, for today you have more wisdom and conditions to assist in cleansing your old self that still suffers. Realize how all the characters you have lived, and all the records of your akashico, manifest in today, just so you have the opportunity to enlighten and heal them. This work is gradual, and in the end it will bring about its liberation from the cycle of incarnations. Therefore, it is rewarding and liberating. Follow that purpose son. I thank the channelers and the Masters for making themselves available for this wonderful work. You help, inspire and enlighten all of us. I would like to ask two questions. 1. When I was about 15 years old, I had a friend the same age as me. He gave me proof that he had very developed psychic faculties, he had information about me that he could not know from other sources. These situations impress me even today. At the time, he said he had contact with beings from other planets and that in a few years I would have. I was very intrigued by all that and you can see that I am still alive today. At the time I had just begun my spiritual quest, and this stimulated me a lot to continue. I'm still looking for evolution to this day, and recently I've met sites like channelers like this and others that bring beautiful messages from beings from other planets or other dimensions. So this ancient story came to the surface, and I ask the Masters: was this my old friend telling the truth? Will I ever have contacts with beings from other planets or dimensions? What must I do to enable myself to communicate with these beings? I have tried to receive messages sometimes in meditation, but I have not been successful. 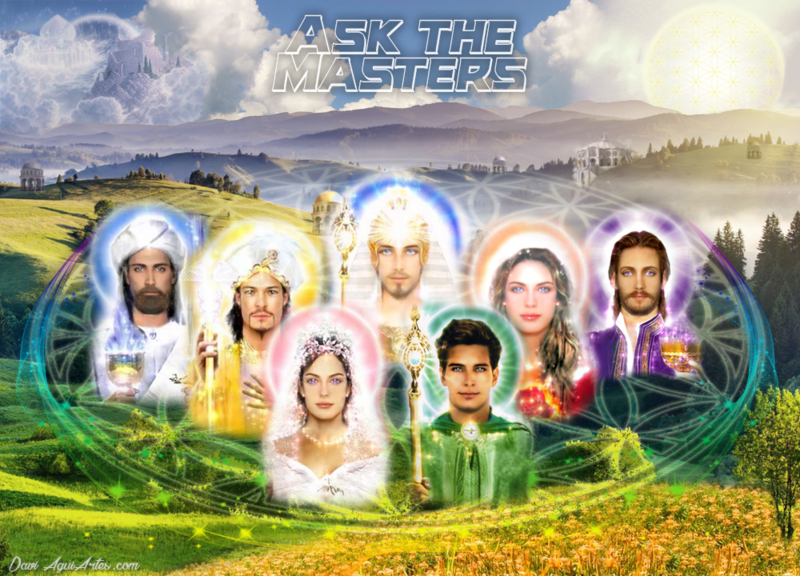 I take this opportunity to ask, if it is appropriate, that the Masters also complement the response and provide some direction for my evolution, in a broader sense, covering my whole journey, and not only the aspects that have already been questioned. Am I following the correct path? What is important for me to do at the moment? 2. A few months ago, I visited an aura reading professional. In the consultation she said that my current stage of evolution was to acquire financial independence. He said that I was impelled by my soul to choose a difficult profession, and that I should overcome this challenge, that of not having a fixed job, working with art, and yet having prosperity and abundance. After this consultation I have read a lot about the law of attraction, about how our feelings shape our material reality. I read a lot about it even here in the messages of the Masters. Although I already perceive a change in myself, in my thoughts, I have not yet acquired my financial independence, that is: I have not yet converted the teachings into physical reality. I would like the guidance of the Masters to help me realize where I might be going wrong. What is missing so that I can change my reality and complete this important stage of my evolution, and material life, which is financial independence. What change do I need to make? As in the first question, I would like if possible the Masters would also complement the answer, for a more general picture. Had I chosen a mission of life and profession impossible? Are my plans to live through art and creativity too ambitious? I moved from town, away from family and friends, to the dream of keeping myself in the profession. Should I stay on this path? Thank you in advance for the availability of the Masters and channelers. My dear daughter. If you ask yourself, why you keep that relationship, it's simply because you know the answer. Otherwise it would not be questioned. He knows that he anchors in this relationship all his pains, his dramas, his unwillingness to take the reins of life, so that he is truly happy. You know what my daughter is, we sometimes accept half a relationship, half truths, half friends, and we become a person more or less, more or less happy, more or less well with life, more or less complete in itself. In the background we hide an inner feeling of lack of merit, of belonging and integration to everything that is. So we live life with these half truths, more or less as we would like, and life passes, it does not make us happy. But we wondered why things can not be as we would like, and I tell you, it's because it's more or less good. Understand daughter, which is a choice that brings you anguish, suffering, doubts, because it does not shine your being, it does not lead you to trust, but it is kept by the fear of rather than being more or less we are nothing. Already said the saying, rather a bird in the hand that two flying. But free birds represent their freedom, the confidence that is releasing that we will feel free. Be in peace.